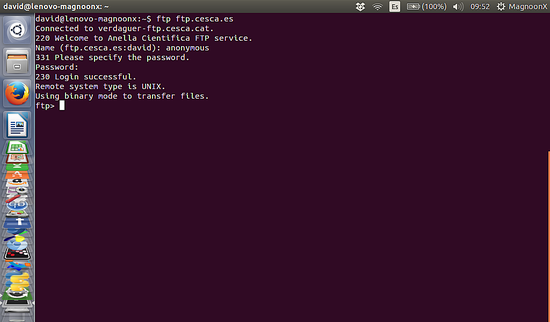 In this tutorial, I will explain how to use the Linux ftp command on the shell. I will show you how to connect to an FTP server, up- and download files and create directories. While there are many nice desktops FTP clients available, the FTP command is still useful when you work remotely on a server over an SSH session and e.g. want to fetch a backup file from your FTP storage. To connect to the FTP server, we have to type in the terminal window 'ftp' and then the domain name 'domain.com' or IP address of the FTP server. Note: for this example we used an anonymous server. Replace the IP and domain in the above examples with the IP address or domain of your FTP server. Most FTP servers logins are password protected, so the server will ask us for a 'username' and a 'password'. When you are logged in successfully. If you dont specify the download directory, the file will be downloaded to the current directory where you were at the time you started the FTP session. The file will be downloaded to the directory previously set with the 'lcd' command. To download several files we can use wildcards. In this example, I will download all files with the .xls file extension. We can upload files that are in the local directory where we made the FTP connection. To upload a file, we can use 'put' command. If you need some additional help, once you are connected to the FTP server, type 'help' and this will show you all the available FTP commands.